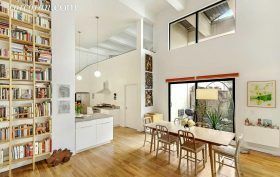 A renovation for this Park Slope co-op left it in lovely condition. The lofty floorplan–which boasts 18-foot ceilings–was taken full advantage of, getting customized floor-to-ceiling bookshelves with a library ladder. Huge windows bring in light, and the upper level of the apartment holds a large master bedroom and office space that looks down onto the living area below. The pad last sold in 2008, for $980,270, and now it’s on the market for $1.65 million.